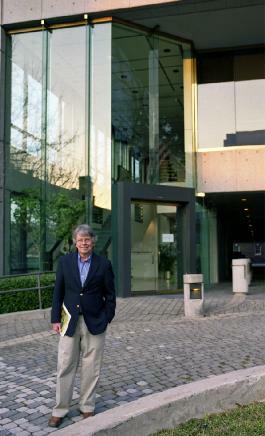 William E. Bray is founder and president of the GFAA. He holds a Master of Education degree from Johns Hopkins University, a Master of Divinity degree from Yale, and a Bachelor of Arts in history and philosophy from the University of Georgia. At Yale Mr. Bray led seminars in Religion in Contemporary Culture working under Chaplain William Sloane Coffin. After studying psychology at Oxford University under Ian Ramsey, for whom Oxford's Ian Ramsey Centre for Religion and Science is named, Mr. Bray served as an assistant professor of psychology at the University of Baltimore and at Endicott College, and as an instructor in psychology and the humanities at Georgia Highlands College. At the University of Baltimore, while teaching psychology, Mr. Bray established the film department teaching courses in Filmmaking as an Art Medium. He then founded the Baltimore Experimental Film Society to encourage young filmmakers, which helped launch the career of filmmaker John Waters by organizing the showing of his first three films, and Steve Yeager, who won the prize at Sundance in 1998 for best documentary. In addition to studying painting at the Schuler School of Fine Arts, photography at the Maryland Institute College of Art, and film at the Orson Welles Cinema School in Cambridge, MA and at Charles University in Prague, Mr. Bray completed Harvard University's Insitute in Arts Administration. He was the first executive director of the Rehoboth Art League's art school and galleries in Delaware, pioneering exhibits in banks and commercial locations. He was the first executive director of the Rome Area Council for the Arts and served as the president of the Georgia Assembly of Community Arts Agencies. Mr. Bray is president and co-founder of Bilbo Books editing and publishing services and management. He is author of Defining Art: Messages from God - updating the Socratic definition of art; and Your Spiritual Lineage: Researching the Genealogy of Your Soul - pioneering a new understanding of the origins of personality development.